This book is not being written to sit on the shelves. I want to make sure anyone who could benefit from the information in this book has an opportunity to get a copy. 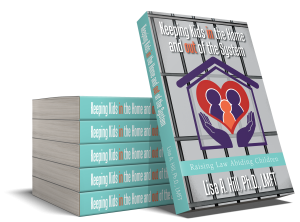 It is my hope that this book will be given out to every parent that enters the doors of probation and social services agencies. I would like school site councils to pass out the books to parents. I would love to see hospitals give out the book in the mommy (or daddy) bags when new parents leave the hospital with their new babies. When adoptions and foster agreements are finalized, I hope the book will be part of the exit package. Perhaps judges could have the book on the bench and strongly suggest parents read it. I would like to see the book given out at back-to-school night. Even people who do not have children or are beyond childbearing age should buy a copy of the book to gift to other parents. I hope people keep a copy of the book with them so when they see parents acting badly, they can hand them the book like a business card. Copyright © 2017. Lisa A. Hill, Ph.D., LMFT. All rights reserved.